Inflatable hot tubs are very popular all around the world as they are easier to use and are easily available. 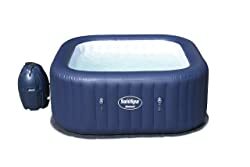 Inflated portable hot tubs are often made up of fine quality vinyl while the non-portable versions are made up of hard acrylic. Both types are in demand, but what suits you depends on your unique needs. 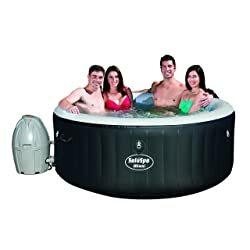 Inflatable hot tubs usually come with space for two to four persons. It can accommodate up to six people and are ideal for personal use. On the other hand, built-in hot tubs can accommodate more people and are more spacious. 2 What Makes Hot Tubs a Good Investment? 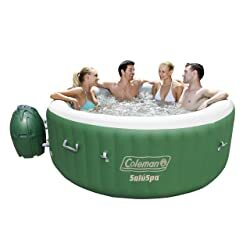 What is the best inflatable hot tub on the market? It is a common question and maybe a bit confusing to answer. A number of brands are now available in the market selling some of the finest inflatable hot tubs, but be sure to pick the best one that fits the bill. Here are some popular inflatable tubs you may want to buy for winter. With a water capacity of 210 gallons and a seating capacity of four people, the Intex 77-inch spa set is going to serve you well for years. It is durable, extremely easy to use, and highly comfortable too. You will have a soothing experience while using this hot tub, all thanks to its pre-designed hard water treatment system. The system works smoothly to make water gentler on your skin. It heats the water quite nicely and keeps it warm for long mainly because of its insulated cover and lock. You don’t have to go through any hassle to maintain the unit, as it features two easy-to-replace filter cartridges. You will also find it quite easy to store when not in use. It does take more space than many other inflatable hot tubs on the market but is still better than a real hot tub. The only issue is regarding its price that seems a bit on the higher side. This hot tub makes the day and is really warm and nice, especially during winters. The heating takes a while to reach 104, but that is still fast and the good thing is that it stays that way. It is easy to set up and fill, and easy to drain as well. They provide you with a garden hose adapter, which will drain most of the water. Whatever is left can be easily removed by opening the drain valve on the pool floor. It is a great stuff to unwind yourself after a long day or just for a family bonding time. The construction is mostly good; the material is fine but a bit flimsy and can wear out easily. But otherwise, the durability and strength are quite good even with a heavy load. It has a digital control panel too, so once you are inside, you don’t have to exit just to adjust the heat, you can do it while sitting inside. Overall, it’s good, but some say that the digital panel is made of low-quality material (though this is not a big issue as the main functionality still works). You can use this spa at least five times a week without any problems. The tub is easy to fill and also to drain. Heating is just perfect and doesn’t take much time (maybe 18-20 hours) to take the temperature to 104. The overall quality and functioning are good. Moreover, it has room for several people (at least two to three couples) to sit comfortably. Even a person with height beyond six inches can use it comfortably. The bubbles do make noise, but that’s not used much, so it is all right. However, running the bubbles cools the water quicker than while the bubbles are off. Moreover, the product seemed a bit pricey initially, but it’s worth the price if you are looking for something for a long-term usage. The only problem is if you have a small problem with a part or you want to get something replaced, that’s a difficult process. The customer service representatives aren’t too friendly and follow only the standard protocols in answering. They don’t try to go beyond that to solve your issues. Incredible looks, perfect working – that’s what this hot tub is! It has a very comfortable seating, because of the padding at the bottom, so you don’t have to pay anything extra to get seats or cushions. You can warm up the temperature quickly if you can connect with an indoor pipe which can fill the tub with somewhat warm water. This is helpful in winters because the water is colder and you will have to wait a very long time before the water gets heated up. The temperature is retained well except that when you put the bubble feature on, it drops quickly. But with bubbles, the tub is just amazing! As a safety feature, the pump and heater shut down periodically (after 72 hours). It is sometimes maddening because when you actually think it has heated up and go inside, it would have shut down! Another issue is that it is difficult to replace the parts if any problem arises. This outdoor spa is quite comfortable for a couple. Though the heating takes more time (the temperature goes to 104 in more than a day), you can work around to buy an external hot water on demand unit, and with that the performance is excellent. You will have no problems with the way temperature is maintained once it gets hot. Using it is great fun after a long day of work, and once you have set the right temperature, you can just soak yourself in and forget everything else. It’s good for a long-term purchase and you can save a lot on going outside looking for spa services which are costly. Another good thing is that the bubbles are not too loud, unlike many other hot tubs, which makes for a good massage without much noise. This product is a great buy with all its features, but some say that the heating time could have been improved to make it even more impressive. It is one popular hot tub with a range of features. A good feature is the availability of inflatable pillows. It makes your spa experience even more impressive and amazing; however, some people may not use the pillows as often as some others do. The presence of an LED light makes it easy to use. The control panel is highly accessible and makes it easier to control the 170 high-powered bubble jets. You don’t have to go through a lot of hassle to inflate and deflate the unit – you can do it in 20 minutes. 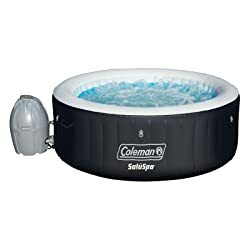 You will find it quite easy to maintain this inflatable hot tub; in fact, you don’t have to use test strips and can easily go with a pH enhancer. An occasional non-chlorine shock coupled with anti-foam will do the job. The size is quite okay too, as an adult can sit in it easily and still stay submerged over their shoulders without their feet touching the other side of the tub. You will actually love it if you like to soak in the hot water. The only issue is its high price; the rest is all good! With its digitally controlled pump, the Coleman 13804 hot tub delivers an amazing performance. It is designed to serve you for a long time, as the outer walls are made using a durable fabric coated material. You will find it quite easy to use mainly because it features a couple of lift handles that make it easier to move the empty spa pool. You can refer to the manual to set it up properly and use in the right way too. It heats the water quite nicely, but it is a good idea to buy a connection for your indoor faucet to use warm water, as it enhances its performance. Keep in mind that if you don’t use warm water, the tub will take about an hour to warm it up by 2F. It is quite spacious but is more suitable for only four average sized people. Maintenance is not an issue too, thanks to the availability of two filter cartridges. The only issue is that the bubbles can cool the water quite quickly. 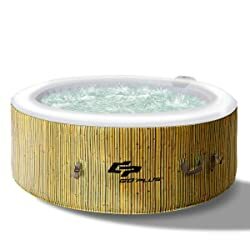 If you’re looking for an outdoor hot tub that takes minutes to get ready and serve you well, you may want to put your money on the 54155E from Bestway. You can even have it set up perfectly on your wooden decking, but it looks equally good on the lawn or wherever you want it placed. It is a durable product, mainly because its walls are made using tri-tech material. The use of this special material also adds to the overall durability and comfort. Another great feature that works for the tub is its salute-massage system. It features 114 air jets that combine heat and massaging jets for an improved performance. It comes equipped with a power saving system, which controls the unit and turns it off automatically once the desired temperature has reached. The water stays warm too, thanks to its cover and safety lock clips – the built-in chamber also ensures proper insulation. With its timer-controlled heating system leatheroid cover, and power saving system, the tub is a great buy for sure. The only issue is that some people think that the pump and heater are a bit on the slower side, but they are not that bad really. What Makes Hot Tubs a Good Investment? They are highly portable and don’t take a lot of space. They come packed in a compact box and you can store them away when not in use. They are easy to assemble and use. You will find an air blower in the package that can be used to inflate the tub. After inflating, you can use your regular hosepipe to fill it to whatever level you require. They are not complicated to use. The filter, pump, blower, and heater come with unit controls, so you can use the tubs with utmost ease. They require little maintenance and are well protected. Depending on the brand, you get a locking spa cover to protect your spa and keep it warm for long. The availability of floating chlorination devices works to keep your hot tub clean. Control panels are one important feature that you must check while buying your hot tubs. Usually inflated hot tubs come with limited features on the control panel with led display. Make sure your spa control panel is accessible from the tub and you don’t need to step out to access the control panel. Some hot tubs come with the additional feature of regulating the hard water. They have built-in filters that remove impurities from the water and minimize the calcium deposit on tub walls. Though this is a great feature, it is not the replacement of a water chemistry regulator. A heater is a crucial part of hot tubs as it regulates the water temperature of the spa. The maximum safe temperature for the spa is 104 degrees Fahrenheit or 40 degrees Celsius. Pay attention to the quality of the heater before you decide to take the plunge. Pumps are vital for blowing air and inflating the tub. They also circulate the water within the spa and helps in attaining the uniform water temperature all over the hot tub. Consider their strength and then proceed with a buying decision. Safety and precautions are necessary when you are using electrical wiring with water. Usually, the heater and pump of inflatable hot tubs come in one single storage unit, which is waterproof. Ensure that the control panel of the tubs is mounted on top of this storage unit to avoid any chances of accidents. Ensure that your inflatable hot tub comes with GFCI i.e. a built-in ground fault circuit interrupter to avoid electric shocks. The 120-volt cord is usually concealed and gives you the freedom to connect it to the safest power supply socket. 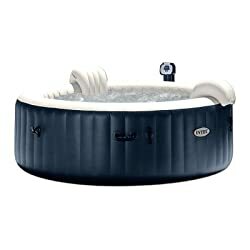 Inflated hot tubs are available in round and square shapes. Usually, the square-shaped tubs are more spacious than the rounded ones and provide you with more room for placing your legs conveniently. Some hot tubs are also available in rowboat style and are more eye-catching. The tubs are also available in different colors and designs and you can choose the one according to your own preferences. Inflated hot tubs come with built-in spa covers to keep your spa warm. They also protect your tub from dirt and dust. Consider the type before buying because there are different types of spa covers available for your hot tubs. Some hot tubs come with only one cover while others come with two or three covers. Some spa covers are made up of leather while some are insulated. Similarly, some covers simply serve as a thermal blanket, but some are multipurpose with inflatable interior and keep attached with tub. The quality of spa covers also differs from one model to another. You can also use your hot tubs without any cover, but it is better to take advantage of this feature. They are easily available in the market so you can also replace the original one with the one of your own choice. Spa jets usually shoot a strong steam of hot water, which is often missing in inflatable versions. The inflatable tubs come with only air jets that give you a completely different experience. Some hot tubs come with only 4 air jets while some others come with 100 to 200 air jets as well. Keep an eye on this important feature while you are buying your next inflatable hot tub. Inflatable hot tubs usually come with a multi-layered ground cloth which provides extra protection and support to your inflated tub. This ground cloth is to be laid on the ground before placing the tub so that any uneven surface may not harm your tub. The ground cloth also helps in maintaining the spa temperature and works as an insulator. If you are intended to place your tub on a soft or uneven surface it is better to buy a hot tub pad. This pad is made up of hard plastic and provides a sturdy base for your inflated tub. You can use this pad as a platform for your inflated hot tub. To keep your inflatable hot tub working properly, be sure to make the right use of the cover. Ideally, you should cover it soon after you’ve finished your bathing session. Cover it even if you have to leave the tub for a few minutes. Consider keeping your motor running at a lower temperature instead of turning it off completely, especially if you use your hot tub more than thrice a week. Never underestimate the importance of using a water filter regularly, as it keeps your hot tub properly maintained. Be sure to change it once in a while though. Ensure your hot tub is not in close proximity of any sharp object. Also, make sure you have a hot tub repair kit handy to manage any repair whenever needed. 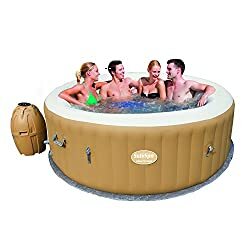 Having an inflatable hot tub means you can enjoy a spa experience whenever you like, but be sure to consider the quality of the tub before you buy it. Pay attention to its size, pump, heater, and other features to ensure you get the best value for your hard-earned money. 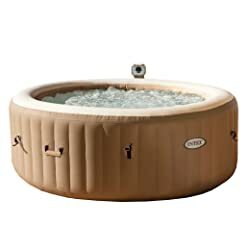 Thankfully, you can consider buying one of the reviewed hot tubs here, as they are popular and have what you’d like to see in a top-rated hot tub.